New Delhi: The GST Council has set Rs12 trillion as the target for goods and services tax collections for the current financial year, buoyed by rising tax compliance in the first year of the new indirect tax regime. The federal indirect tax body noted that the average monthly receipts in the last fiscal year, despite several disruptions, were Rs89,885 crore, marginally below the Rs91,000 crore target. “GST receipts in FY18 have not been bad. The revised monthly revenue target for FY19 takes into account a 14% increase in states’ revenue growth estimate for compensation,” said a finance ministry official, requesting anonymity. 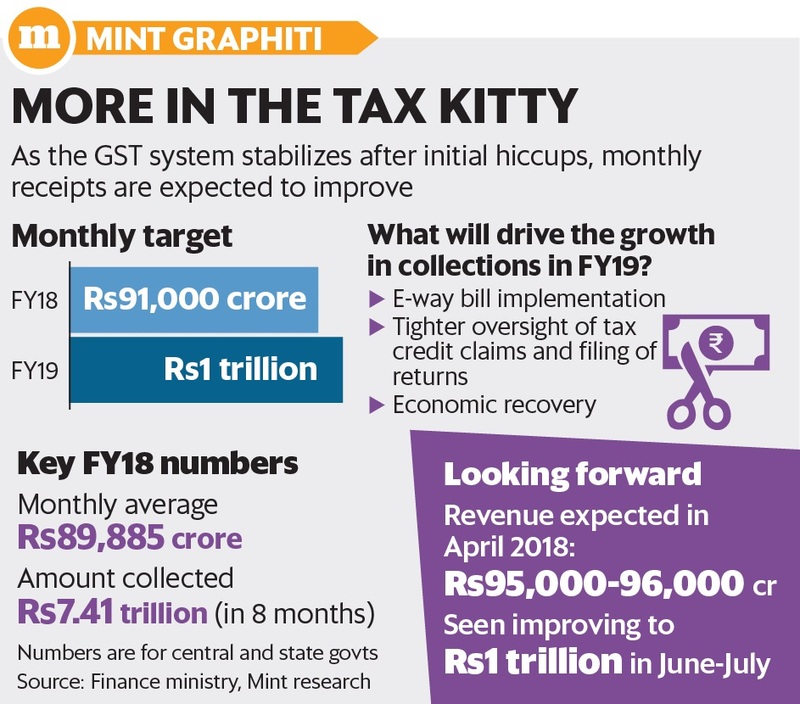 Policymakers’ confidence in generating higher revenue from GST stems from the anti-tax evasion measures being put in place and the ongoing economic recovery. The positive impact of the e-way bill, which tracks goods movement electronically and was implemented from 1 April, is expected to reflect by June or July, the official added. Economic growth has also accelerated from 5.7% in the April-June period of FY18 to 6.5% in the second quarter and 7.2% in the third. Growth is projected at 6.6% in FY18, implying that growth in the final quarter will be 7%. The steps meant to curb evasion include adoption of e-way bills, matching information from various sources with declared sales and the proposed revamp of the return filing system. Another official pointed out that the system was stabilizing and revenue collections were improving. “GST receipts in April (for sales in March) are expected to be around Rs95,000-96,000 crore,” said the second official, who also spoke on condition of anonymity. A few rule changes in the offing for better compliance are expected to add momentum to revenue growth. The authorities are now linking e-way bills generated by businesses for goods’ shipment with their sales returns in GSTR 1 form to detect tax evasion. “Same invoices go into e-way bill and to GSTR 1. Once GSTR 1 returns are filed, we can match the data. We know who the sender is and who the buyer is. We can pick up all the e-way bills of a sender and see if they are part of the GSTR-1 filed,” said Prakash Kumar, CEO of GST Network, which processes tax returns. Although taxpayers can opt to automatically fill their e-way bill details in GSTR 1, many are yet to do so. The increasing linkage between direct and indirect tax return filings is also expected to check evasion. Tax return forms for assessment year 2018-19 mandate small businesses to quote their GST identification numbers (GSTIN). All small businesses opting for presumptive taxation scheme will have to provide GSTIN and details of turnover reported under GST. Businesses with revenue less than Rs2 crore do not have to maintain books of accounts and can instead pay tax on the basis of a certain percentage of their revenue.